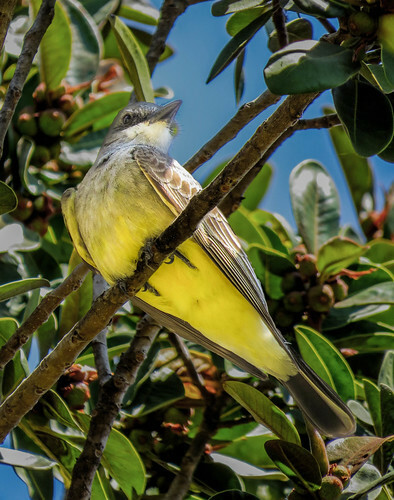 An eye-catching bird with ashy gray and lemon-yellow plumage, the Western Kingbird is a familiar summertime sight in open habitats across western North America. This large flycatcher sallies out to capture flying insects from conspicuous perches on trees or utility lines, flashing a black tail with white edges. Western Kingbirds are aggressive and will scold and chase intruders (including Red-tailed Hawks and American Kestrels) with a snapping bill and flared crimson feathers they normally keep hidden under their gray crowns.